This week’s Top Ten Tuesday, hosted by The Broke and the Bookish, really made me think about what books I want to read in the next few months. I’m proud to say that I read nine of the ten books from my autumn list, so hopefully I will have an equally good success rate this season. What books are you looking forward to reading this spring? And which book from my list should I start with? 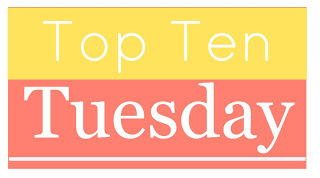 This entry was posted in top ten tuesday and tagged books, classics, tbr list, to read list, Top Ten Tuesday, YA Books, young adult by Alison Doherty. Bookmark the permalink. I love The Virgin Suicides- anything by Eugenides is gold, though, if you ask me. I’ve read (and loved) Middlesex and The Marriage Plot, so I’m excited to cross this one off my list. I’ve been wanting to read The Virgin Suicides for awhile now! My English professor has mentioned it as least four times this semester, and the title just sounds interesting. And then The One and All the Boys I’ve Loved Before. AHHHHH. So excited for those books. I’m super excited for both books, even though I bet they are going to be pretty different. Han and Cass are probably the two books I’m most excited about reading this spring. Thanks for stopping by! Really? Bellman & Black is the one book from my fall TBR list that I didn’t get to. I loved The Thirteenth Tale so much! I’ve only read Bellman & Black on your list. Enjoy the spring reading. Thanks for the suggestions. I’m looking forward to both books! The House of Mirth is one of my all-time favorite books. Hope you enjoy it. I read it in high school and college and now it’s one of those I revisit like an old friend. The Virgin Suicides is excellent, but I prefer Middlesex. I have heard The Corrections is amazing, but having read Freedom in January, I’m not sure I can do another Franzen in 2014. Speak is a must-read too. Awesome list! Yay, thanks for making me even more excited to read these books. House of Mirth was actually the first book I bought on my kindle back in 2008, but somehow I still haven’t gotten around to it. Thanks! I know it sounds silly, but I’m so excited to see if America ends up with Maxon. I’ve been curious about The Virgin Suicides- I’ve only seen the movie. And Speak is a good one you can read in one sitting. Yay for Jenny Han. Happy spring reading! Thanks for the tip about Speak. I will block off an afternoon to read it in. Thanks for the tips. Enjoy your spring reading as well! Nice mix on your list! I started Bellman & Black last summer and I need to get back to it. Speak and Gilded are also on my radar, though not on my top 10: http://myoverstuffed-shelves.blogspot.com/2014/03/spring-reading-top-ten-on-tuesday.html. Thanks! It looked like there were some really interesting books on your list as well. Ahhh I read Speak years ago now, but that book is fantastic. One that definitely stays with you. Happy reading! That list is fantastic. Speak will never leave you. All the Boys I’ve Loved Before is a lot of fun to read. Enjoy all these great books! Thanks! I really can’t wait to get my hands on both of those books!